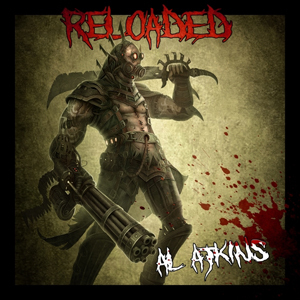 Al Atkins, the original voice of heavy metal titans JUDAS PRIEST, has announced a new solo album, Reloaded, that will be released by Gonzo Multimedia. The album is a collection of tracks which touches on Al’s early years with the mighty JUDAS PRIEST, up until his last live band HOLY RAGE. It features special guest appearances from Ian Hill of JUDAS PRIEST, who performed on the original recordings of some of these classics like “Victim Of Changes” from the Sad Wings Of Destiny album. Ian has never recorded with anyone outside of JUDAS PRIEST until now. It also features guest appearances from John McCoy (ex-GILLAN) Ralf Scheepers (PRIMAL FEAR) dueting with Al on “Victim Of Changes”, a solo from Roy Z. (HALFORD, BRUCE DICKINSON), Japanese guitarist Tsuyoshi Ikedo from UNVIEL RAZE, Stu “Hammer” Marshall of DEATH DEALER, Chris Johnson from HOLY RAGE, from the UK Rob Allen on drums and last but not least long time friend and collaborator guitarist and producer of many of Al's albums, Paul May. These tracks have appeared in various forms on many albums over the past forty years. Reloaded also features a bonus track that is an excerpt of a guitar solo from the very JUDAS PRIEST demo featuring Ian Hill on bass and KK Downing on guitar, a never heard treat for all JUDAS PRIEST fanatics. The album was once again recorded at Rock Solid Studios in the UK. A global gathering from the world of metal, revisiting some of the tracks that launched the Legend that is JUDAS PRIEST to the solo albums that followed over the next forty years. Cocked, Reloaded and ready to rock. Al Atkins is best known for being the original singer with Midlands heavy rockers JUDAS PRIEST, with a wife and young daughter to support and no record deal in sight, Atkins was forced “to get a haircut and a 9-to-5 job” in May 1973. He was replaced by Rob Halford, who found himself singing many songs that were originally written by Atkins. Consequently, the album Rocka Rolla gives a portrait of Atkins' original vision for the band. Atkins eventually formed another band, LION, and went solo after it dissolved, releasing four albums in the 1990s and a final, fifth album in 2007 as a solo artist. Despite being at the age that most men are thinking of retirement, Al is still one of the hardest rocking frontmen on the planet, as this album bears testament. The album is available for pre-order through Al's Pledge Music campaign right HERE. A promo video is streaming below.